Building an addition onto your home is an expensive endeavor. However, it typically adds value to your home when you sell it. The average home addition cost is difficult to specify due to a variety of variables, including; region, local contractor labor costs, size and type of home addition, and building materials used. What may sound surprising, the average cost of a home addition per square foot is cheaper when building up than building out. Building up does not require any excavation and foundation work, thus why the average home addition cost is cheaper. This said, building up has its own set of unique problems. Often building a second story addition requires the occupants of the home to move out for some period of time during the construction. In addition, extra care and insurance is required for protecting the contents of the home during the construction of the home addition. Moreover, extensive demolition, e.g. removing the home’s roof, or at least a portion of it, is required. And, a new roof has to be installed onto the home once the second story addition walls have been framed in. In addition, the existing home’s framing, particularly the first floor’s ceiling joists, typically need to be beefed up with larger lumber. At the national level, room addition cost estimates can vary from as low as $70 per square foot, to well over $200 per square foot. The average home addition cost for a basic attached family room addition with no plumbing, and no expansion of the HVAC system will cost $100 per square foot or more. However, the larger the family room addition, the lower the cost per square foot. Like the manufacturing of anything, the larger the volume, the lower the unit cost; economies of scale. On a national level just the framing of an addition costs on average around $8 to $10 per square foot. Again, the cost per square foot decreases with the increase in size of the home addition. This cost relates to just the framing of the walls and roof, but does not include the cost of installing windows and exterior doors or shingling the roof. An addition that includes plumbing greatly impacts the average cost of a home addition per square foot. With kitchen additions, the home addition cost per square foot could jump to well over $200 per square foot, due to the required additional plumbing, cabinetry, appliances, specialty lighting and higher end flooring products. It’s a similar situation with bathroom additions, though their costs per square foot are not quite as high as a kitchen addition. First, it’s imperative to clearly articulate why the need for the additional living space. Second, come up with a figure on how much you can afford to spend on a home addition. 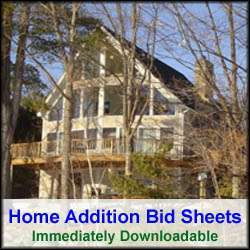 Then, develop a draft set of home addition plans. From these plans you should be able to get some rough estimates on your home addition costs. Based on these initial cost estimates, you can go back and adjust the size of the home addition to match your budget. It is well worth the cost and time to hire an architect to draw up a set of detailed plans. Besides providing you with a clear image of what your finished home addition will look like, they also provide the construction and material details for obtaining accurate home addition costs and pulling building permits. Once you have an accurate total construction cost for your home addition you can divide it by the number of square feet in the addition to arrive at a home addition cost per square foot figure. You can then compare this cost with the average home addition cost per square foot in your area to see if the building costs are in line with your local real estate residential construction market. A few years back I acted as my own general contractor on building an attached family room addition onto my home. I hired all of the various sub-contractors for items that included; excavation and foundation work, framing, roofing, electric and drywall. I put on the house siding, installed the insulation, and did all the finished carpentry myself. The addition mainly attached to the back of my house, however, a portion of it also wrapped around one side of it, such that we could enter the family room addition via the kitchen area. Due to the fact that a significant amount of the exterior siding had to be removed from the house, and the fact that we punched in a ten foot opening into the side of the house, the total cost for the home addition came to $52,500. The size of the family room addition was 400 square feet. Dividing the $52,500 by 400 square feet, the home addition cost per square feet for my project worked out to be $131 per square foot. Note that the project involved no plumbing work, and no increase in the HVAC system. 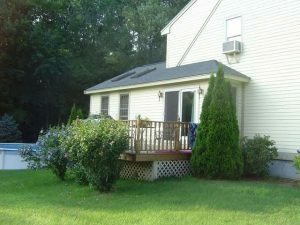 I chalked up the relatively high cost per square foot cost for my home addition, due to the facts that I live in an expensive area of the country, the greater Boston area suburbs, and that I used high end construction materials. If I had built the room addition in another part of the country I think the costs for my project would have come much closer to the national average home addition cost.